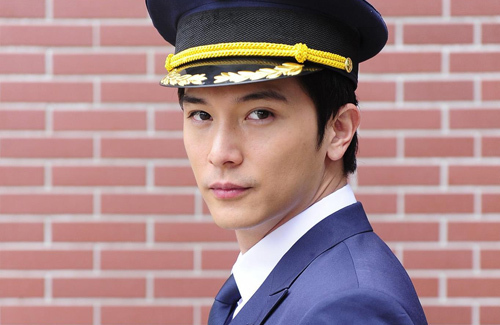 After a successful idol drama career, Taiwanese actor Roy Chiu (邱澤) is preparing to move into the mainland Chinese movie industry. His upcoming romance film, Romance Descends from the Heavens <浪漫從天降>, is expected to open in theaters by the end of the year. Helmed by influential female director Ning Ying (寧瀛), Romance Descends from the Heavens is the story of an unconventional flight attendant, played by 16-year-old mainland Chinese actress Guan Xiaotong (關曉彤). In an amusing and light-hearted turn of events, she meets a nouveau riche cook (Venice International Film Festival Best Actor winner Xia Yu 夏雨), as well as a handsome airplane pilot (Roy Chiu), and must decide between the two. Having starred in well-received mainland Chinese dramas like My Daughter <夏家三千金> and The Girl in Blue <佳期入夢>, and shooting to fame with the 2011 Taiwanese idol drama Office Girls <小資女孩向前沖>, Roy only recently made his foray into the film industry. Last year, he appeared in the Taiwanese movie Good Luck! Boy <加油！男孩>, which marked his first time headlining a feature film. Though Romance Descends from the Heavens is Roy’s first mainland Chinese film, director Ning Jing and producer Han Jun (韓駿) were extremely impressed by his professional attitude. When preparing for highly emotional scenes, Roy would arrive on set several hours in advance to read his lines aloud and ensure that his pronunciation matched that of the standard Mandarin dialect. Roy may have a steady fanbase in mainland China, but he readily admitted that he is not yet the most outstanding actor. However, he maintained that he would strive to be the most hardworking actor, so he would not let down his fans. wow a real 16 year old girl romance w/ older men? roy’s hot but he’s 32…. Maybe mainland is lacking of talented older actresses to take up this role. 16 year old in a romance movie with older guys… wouldn’t it seem like an opportunity for paedo to groom teenagers for nefarious purposes? wow 16yrs old pair up with 30something guys, sound kinda wrong lol. Roy still looking young damm fine!